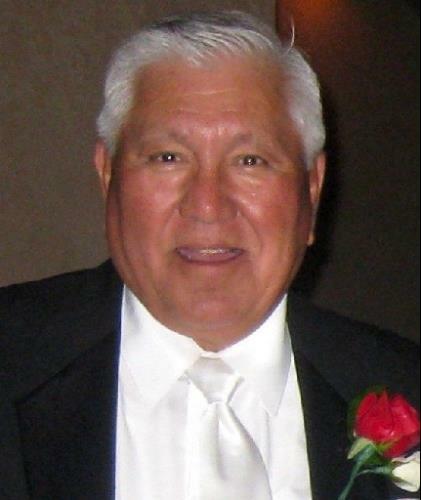 Guevara, Jesse M. Saginaw, Michigan Beloved husband, father and grandfather passed away on Sunday, March 5, 2017. Age 80 years. The son of the late Bartolo and Francisca (Mendoza) Guevara, Jesse was born January 27, 1937 in Saginaw, Michigan. He served in the U.S. Marine Corp. He married Rose Casarez on September 3, 1960. She survives him. Jesse was employed at G.M. Saginaw Manufacturing for 42 years retiring in 1999. He was a member of Holy Spirit Catholic Church and Knights of Columbus Council #4232. Jesse was a trustee at Moose Lodge #82. He enjoyed watching his children and grandchildren in their sports activities, an avid Detroit Sports Fan and enjoyed golfing. Surviving besides his wife Rose are two sons and two daughters, Julian and Alicia Guevara, Bridgeport; Catherine and Daniel Beck, Rochester; Christine Guevara, Saginaw; James and Rebecca Guevara, Saginaw; nine grandchildren, Angelina, Julian II, Alyssa, Joshua, Anthony, Victor, Noah, Raul and Rosalie; three great-grandchildren, Royal, Rosie and Ezekiel; five sisters and three brothers, Alicia Guevara, Sister Marie Rachael Guevara O.P., Ofelia and Thomas Burrows, Virginia Guevara, Juanita and Frank Medel, Ralph M. and Elena Guevara, Gilberto and Guadalupe Guevara, Arturo and Angela Guevara; several nieces and nephews. Jesse was preceded by his son James Robert Guevara and two brothers, Michael Guevara and Rafael Guevara. Funeral Liturgy will take place 11:00 a.m. Friday, March 10, 2017 at Holy Spirit Catholic Church, 1035 N. River Rd., Saginaw. Rev. Fr. Peter J. Gaspeny will officiate. Committal Services will take place in Mt. Olivet Cemetery with Military Services conducted by V.F.W. Post #1859. Honoring Mr. Guevara's wishes cremation will follow. Friends may visit at The Snow Funeral Home, 3775 N. Center Rd. (between Shattuck and McCarty), where the family will be present on Thursday from 2:00 p.m. to 8:00 p.m. and at the church on Friday from 10:00 a.m. until time of Mass. The Knights of Columbus Council # 4232 will pray the Rosary at 3:00 p.m. Thursday at the funeral home and a Vigil Service at 7:00 p.m. Those planning an expression of sympathy may wish to consider memorials to Holy Spirit Catholic Church. ***JESSE GUEVARA'S FUNERAL, SCHEDULED FOR FRIDAY, 3/10/17, HAS BEEN MOVED BACK TO HOLY SPIRIT.